So just to be clear, this article is about how fake and spammy Google business listings put up by competitors lower the chances of your business listing from being seen. 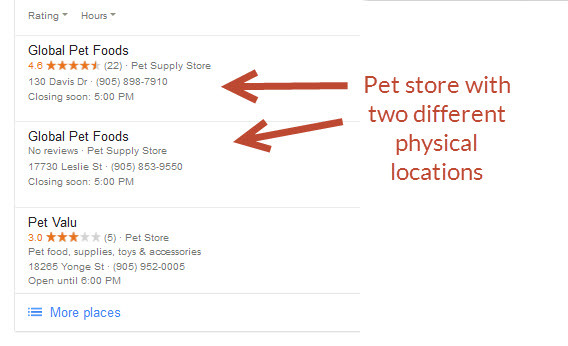 If you are looking for how to remove a fake review that has been put up on your listing, then please this article: Flagging Inappropriate Listings from Google. 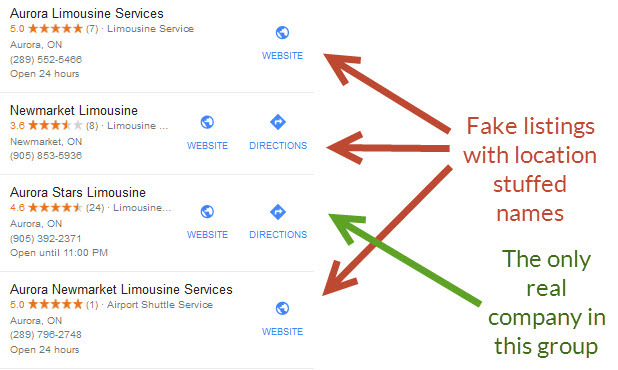 If you are not sure how the Google business listings work, then I encourage you to take a look at this page about understanding local SEO. If all companies adhered to the rules laid out by Google, then we wouldn’t need to be discussing this, but there are always unethical companies looking to get ahead. In short, a company should have only one listing per business, and the listing name should be the legal name of the business. As well, the business listing should only contain the legal name of the business, and no other information such as extra modifiers, service related keywords, or location information, (unless they are actually part of the legal name). In some select industries, there may be more than one listing for the same address when the business has multiple practitioners at the same locations (for example dental offices and lawyer firms). The business can have it’s own main listing, and each practitioner may have one listing as well. Find more information about setting up practice and practitioner listings for Google My Business. Unfortunately, this is not the case in many industries, and so part of the job of a local SEO consultant is to search through these listings to see if any of your competitors have broken the listing rules to try to get extra business that they wouldn’t ordinary get. In industries where a company receives clients or customers at it’s physical place of business (for example dentists, veterinarians, retail stores), the fake listing problem is usually non-existent. However, in industries where the business comes to the customer, (for example cleaning companies, locksmiths, landscapers) then the addition of extra listings using different locations in the area services can result in a significant increase in calls. Unfortunately Google is not always adept at automatically filtering and removing these fake business listings made by competitors. This is very detrimental to actual real businesses in the area that abide by the guidelines. Instead of only competing with one or two other listings, their listing has to compete with five or more listings (depending how aggressive the spammer is). So it falls to us, as SEO consultants, to look for fake listings and try to get them removed to help our clients compete better. Sometimes it is easy to have a listing removed, we can flag the listing and the algorithm will automatically accept our edit. Sometimes however, it takes more work to get a listing removed. We might need to contact Google and provide them proof, for example that the address used to verify the business was an employees home address and not the main business address. Spamming companies come up with very ingenious ways to bypass the rules and we have to be constantly looking out for these fake listings. In really bad industries, Google is trying to legitimize businesses by asking them to provide proof that they are operating a real business at a certain location. Right now, this extra verification is only available through Home Service Ads for specific industries in select cities, so until it rolls out this change to everyone, SEO’s will still have to help their clients with bad competitor listings. I encourage you to take a look at the listings by entering various keywords that people would use to find a business such as yours to see if there are competitors that are breaking the rules. You might be losing considerable amounts of business and not even realize. If you find you are unable to get them removed yourself, then it is possible you will need the help of an SEO consultant to aid you in building a case and bringing it to Google. If you think you have any competitors that are eating into your client base, just contact me and I would be glad to take a look at the business listings in your area to see if I can help.